As part of our One Year On series, we caught up with BA Textile Design alumni Abbi Fletcher who tells us how her practice has developed since she graduated and her ongoing collaboration with the world of neuroscience. I moved house 3 times already. I make short fashion films and music videos now alongside working on the Research team at UAL. I also got my work auctioned at a Moncler charity event ‘Freeze for Frieze’, alongside my fav drummer Charlie Watts. That was cool! Tell us about your practice, how has it developed since graduating? After graduating, I knew I really wasn’t done developing my final project. I’m fascinated by the future of textiles and the evolving relationship between science and art. Having analysed this topic through my thesis at Chelsea Collage of Art graduating in 2016 in Textiles design, I’ve been able to translate that knowledge through my practical work; Since then I have specifically focused on how the relationship between art and science is positioned amongst existing boundaries, and how this can be used to anticipate future needs and desires whilst taking into account the challenges that lie within the realm of textiles and scientific innovation. I’ve just designed an enormous set for up-and-coming music video for duo Frank Gamble’, who are the latest group to sign to PMR Records. I covered a kitchen entirely with psychedelic floral prints and painted dancers to camouflage into the background. That was pretty fun, the song is called Myths and its out soon, so keep ya eyes peeled! What have been your greatest achievements since graduating from Chelsea? 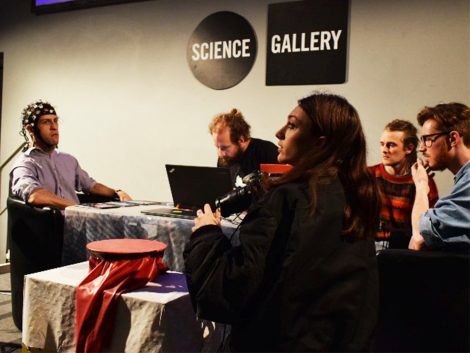 I recently won a neuroscience brain hackathon in Dublin at the Science Gallery. It was pretty unexpected, but since graduating I have been contacting neuroscientists from various institutions and labs to see how we can collaborate. I want to see how we can use EEG data to form sound, texture and imagery, to make our senses more accessible. I want people to hear the melody of brainwaves, and not only see the manifestation of the music, but also physically feel it through a fabric. Since we won the hackathon, we have qualified for the opportunity to pitch our idea and prototype to win a 1-3 month incubation program in San Francisco with DART 17. DART 17 plan to help our team to test the prototype and collect feedback from technology companies, industry experts, and investors in Silicon Valley! So that’s pretty much me for the next few months! Tell us about your time at Chelsea, what do you miss? What did you enjoy the most? For me Chelsea taught me the importance of collaboration. Working in an environment with so many different specialisms and subjects, I was constantly learning and seeing new things. I miss going into university and seeing so many different ideas developing and students influencing one another. There was always some fine art thing happening on the parade ground, and seeing the local’s reactions as they walk past was continuously amusing. What is the most important thing you learned on the course? I learned how to think critically and ask questions. Don’t get frustrated by things you can’t control. Sometimes experimenting with new things, makes unexpected happy mistakes. What advice would you give to our students who are about to graduate? Don’t be afraid to ask for things. If you don’t ask, you don’t get. If you show interest, people will want to help you! It’s important to not feel inadequate, if someone doesn’t reply, don’t worry. It’s cliché, but there’s plenty more fish in the sea!